Kick these farm characters to make them moo-ve! 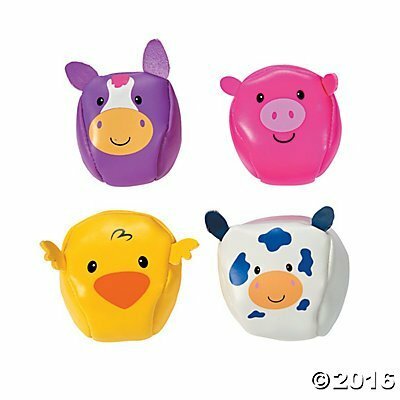 A fun addition to barnyard birthday party supplies, this assortment of kick balls features little cows, chicks, horses and pigs. Your own little roosters and hens are sure to ruffle their feathers in delight as they spend hours of active fun kicking these balls around. Add them to classroom rewards to have kids saying "howdy" to increased participation and engagement. Vinyl. 2"